Cook without oil, butter or grease with Red Copper®! Hate scraping fry pans and cleaning after dinner? With Red Copper, food comes right off making clean up a breeze! Everything you've heard abour Red Copper is true! Stop being a skeptic, try one for yourself today! Has food sticking to your pans gotten completely out of hand? Are you tired of scraping, scrubbing, and all those scratches? Introducing Red Copper®, the revolutionary non-stick ceramic cookware made of ultra-tough Copper! READ FULL DESCRIPTION It's lightweight yet super strong. It won't scratch, chip, or peel into your food. It's PFOA and PTFE free, so it's safe for you and your family. You can use this 10" fry pan for anything - flambé desserts, broil flakey fish, or bake chicken parmesan. All your food slides right out and it's even oven safe up to 500°F. Red Copper® is the most versatile pan you've ever used. Plus, it's even dishwasher safe! Whisk it, biscuit, upside down it, all with Red Copper®. You can get your 10" non-stick Red Copper® Pan with Cathy Mitchell's Quick Meals and Desserts Recipe Book for just $19.99 plus $9.99 shipping and handling. For a limited time, when you place an order, you can double the offer and get a second Red Copper® Pan and recipe book and the 8" Red Copper Forever Sharp Knife for just a separate fee of $12.99. Plus, you can take advantage of other great offers. This special offer won't last long so order now! Red Copper® is lightweight yet super strong. It's guaranteed to resist scratches! It's the most durable pan you'll ever use. Non-stick ceramic means everything slides right out of Red Copper®. 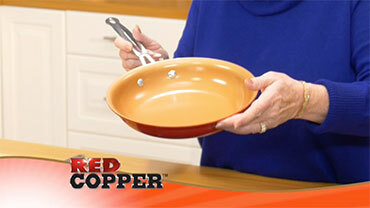 You can use Red Copper® for everything - It's a baking pan with a handle. OFFER: Get your 10" non-stick Red Copper Pan with Cathy Mitchell's Quick Meals and Desserts Recipe Book for just $19.99 plus $9.99 shipping and handling. Double your offer and get a second Red Copper 10" Pan and recipe guide, PLUS the 8" Red Copper Forever Sharp Knife for just a separate fee of $12.99. UPGRADE to our Deluxe Offer and receive the double coated Red Copper 10" pan and recipe guide for only $29.99 plus $9.99 shipping and handling. Double your deluxe offer to receive 2 Double Coated 10" pans, 2 recipe guides, AND 1 8" Forever Sharp Knife. Just pay a separate fee of $22.99. Order now! GUARANTEE: Red Copper 10" Pan has a Built To Last Guarantee. Should anything happen to your Red Copper 10" Pan under normal usage simply return the unit and you will receive replacement, less shipping and handling. Mistreatment, misuse, and intentional abuse of Red Copper 10" Pan is not covered under the Built To Last Guarantee. Select Your Red Copper Offer Now!!! Check out these other great products by Red Copper. Hear from other Red Copper® customers how much they love it, and why you will too! Check out all the news for Red Copper® and it's creators at TeleBrands featured all over the world.